On Wednesday, January 24, a group of veteran (and a couple more modern) artists will be playing together at City Winery in New York in a salute to the late Gregg Allman. Southern Blood: Celebrating Gregg Allman will include performances by Billy Gibbons, Warren Haynes, Alison Krauss, Graham Nash, Tommy Emmanuel, Devon Allman, Luther Dickinson, Cody Dickinson and Jackie Greene. 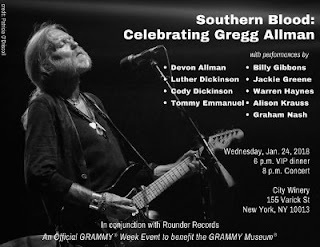 The show is being put on in conjunction with Rounder Records and will benefit the Grammy Museum. A VIP dinner will be held at 6 PM that night. Tickets are $1,000. Seated tickets are sold out. Allman died on May 27 due to complications of liver cancer.